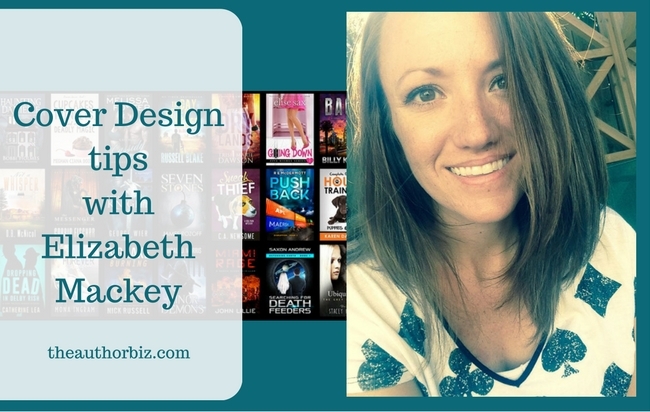 Cover design whiz and graphics designer Elizabeth Mackey joins us on this episode of The Author Biz podcast. You can’t judge a book by its cover. Right? The old saying may be true, but unfortunately for authors, a great many readers won’t have the opportunity to judge your book unless your cover appeals to them. Today’s guest is cover designer Elizabeth Mackey. She’s a military wife, mom, and freelance graphic designer. She graduated with honors from the Art Institute of California, San Diego, with a Bachelors of Science Degree in Graphic Design and she has 14 years of experience in graphic design and over 20 years of experience in fine art. Elizabeth’s name came up during Author Biz Episode 82 when both guests of the show mentioned using her for their covers. I did some research and loved the work Elizabeth was doing for her many clients, which include past Author Biz guests, CA Newsome, Bobbi Holmes, and Russell Blake. This week’s show is also one that was recorded in video and I think the video enhances things a bit during the discussion because we’re able to bring some “show and tell” elements to the show. Elizabeth mentions several specific covers as examples, for both series and stand-alone books, and where available I’ve dropped those images into the video. You’ll still get 95% of the value from just listening, the way you normally do, but this might be one episode that you’ll want to consider watching. Prior to the interview, I mention (in the podcast, not the video) two things that caught my eye over the past week. The first, from author Bruce Cantwell, is a method of serializing a book to attract readers to your email list. The second is a new Universal Book Link service for digital book sales from Draft2Digital called Books2Read. This new service is free and extremely powerful. Universal Book Links provide a single URL that an author, publisher, or fan can share online. Instead of linking to just one digital bookstore (or posting lots of links to lots of different stores and territories), you can share one Universal Book Link, and a reader can follow it to reach the book on her favorite store. In this 41 minute episode, we discuss her process for designing covers, the differences between designing covers for a stand-alone book and a series, the importance of fonts and even some of the resources she uses in her cover design business. We walk through the information Elizabeth requests from new clients before beginning a cover design project. Elizabeth shares her thoughts on the importance of selecting the right font for your cover. We discuss the pros and cons of using a full face on your cover. 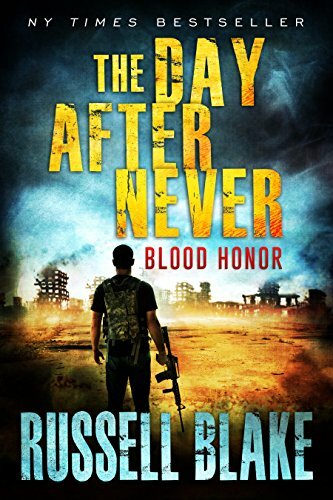 Elizabeth tells the story of where the model came from for THE DAY AFTER NEVER series, from author Russell Blake. We discuss the difference between designing the cover of a stand-alone novel versus covers for a series. Elizabeth shares her thoughts on expanding the branding created with your cover design to your social media accounts. We discuss what it means when people say your cover needs to look as a thumbnail image. 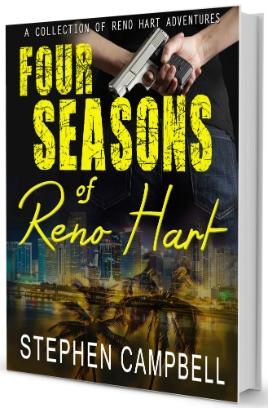 We specifically discuss a recent project Elizabeth did for author Jeff Elkins. Jeff had developed some cover ideas on his own for his first book, MENKEN AND THE MONSTERS and shared them with the Author Biz Facebook Group. Based on feedback from inside the group and elsewhere, he decided to hire Elizabeth. 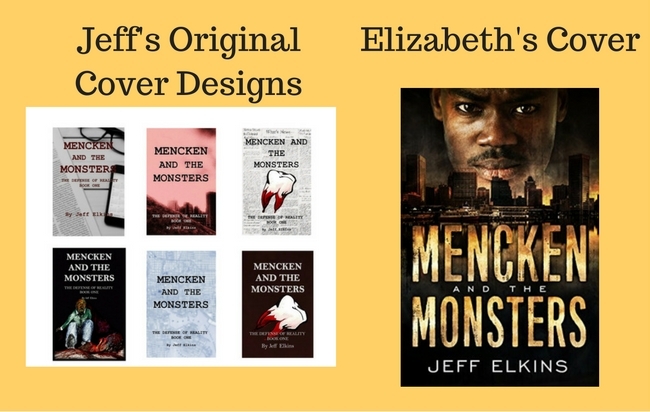 You can compare Jeff’s possible covers with Elizabeth’s design below. As a final interview note, we discuss Elizabeth’s choice for stock images. She uses one of the monthly subscription options from Big Stock Photo.